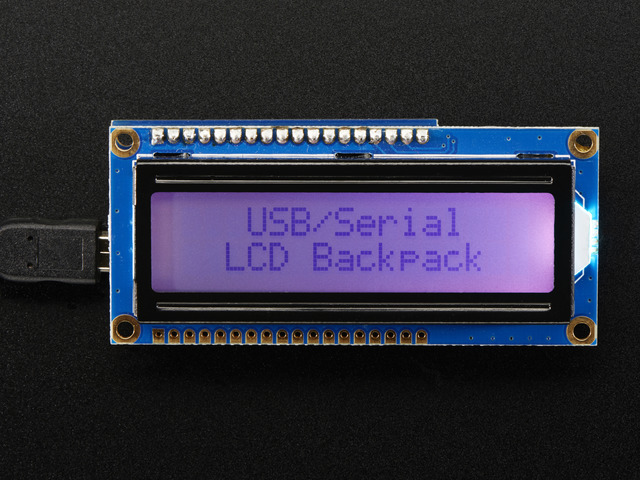 This guide walks through the process of assembling and configuring our LCD displays with USB/serial backpack and stand as a realtime system monitor. These displays are great for monitoring the health and status of “headless” systems such as servers, small Raspberry Pi installations, or as an auxiliary information display on your regular computer. To use the LCD+Backpack on Windows systems, you’ll first need to download this .INF driver file. This makes the device appear as a COM port. Then you’ll want to download LCD Smartie, which provides all the system status and monitoring information. From the “Hardware” tab of the Properties panel, click the “Properties” button. It’s properties all the way down! When prompted, select “Browse my computer for driver software” (do not use the automatic search). You’ll be presented with a file selection dialog. Navigate to the location of the previously-downloaded .INF file. It’s probably in the Downloads folder. You’ll see a message about an unsigned driver. That’s okay, tell it to go ahead an install. In a moment, the LCD+Backpack should show in the Devices panel as a “Communications Port,” along with a COM port number. Keep track of that port number, you’ll need it in a moment. 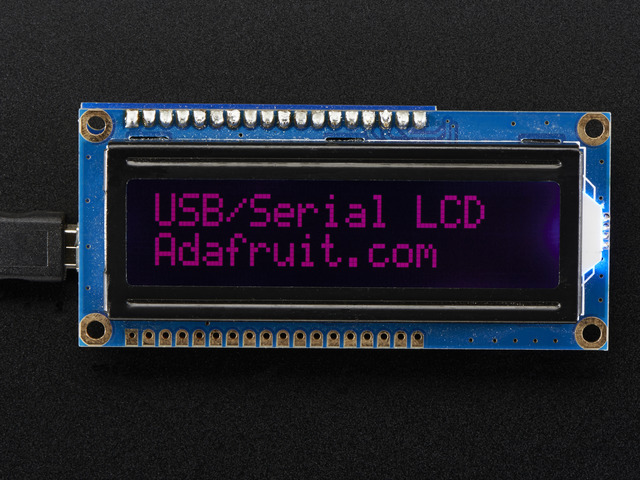 If you haven’t extracted and installed the LCD Smartie software, go ahead and do that now. LCD Smartie is a “classic” piece of software…the last official release was in 2007…but the good news is that it works well with current versions of Windows, though the user interface is a bit dated. This is a complex package with a ton of features, more than we can cover here. Some instructions are available on the LCD Smartie web site, or you can explore the GUI and work out most of these options. First we need to set it up for our LCD+Backpack. Click “Setup” in the small LCD Smartie window, which brings up the massive configuration dialog. From the “Screens” tab, in the “Display settings” section at the top right, select the “Plugin” tab. Select matrix.dll from the Display Plugin menu, and change the Startup Parameters to reflect the correct COM port for the device. You will need to quit and restart LCD Smartie after changing the COM port setting. In the “Startup/Shutdown” tab, you’ll see there are options to run the software automatically at system startup, so you don’t need to go through this process every time. You’ll be prompted whether you want to install all the prerequisite packages. Answer “Y” and the software should all be download and installed in a minute or so. It’s not really that hard, just involves a few extra steps. This should take just a few minutes to complete. If it stops due to a missing library, you’ll need to track down and install the missing components (perhaps using apt-get). Remember that name “ttyACM0” (or whatever yours has assigned), you’ll need it for configuring the software. With a Raspberry Pi, we can skip the USB port and connect the LCD backpack to the Pi’s GPIO header…especially useful on the Model A board. Or simply delete that line. Remember the name “ttyAMA0”, you’ll need it for configuring the software. The system must be rebooted for this to take effect. You can either do that now, or after setting up the LCD configuration files. # settings relevant to the Adafruit USB+Serial Backpacks. # YOUR SETUP. Last character should ALWAYS be slash. # Output device. IMPORTANT: EDIT THIS FOR YOUR SETUP! # Speed applies only to serial pins; ignored w/USB. # Display size, type, contrast and brightness range. This is the device name for the LCD backpack, which was discovered in an earlier step. On most Linux systems it will be /dev/ttyAMC0 for a USB-connected backpack, or /dev/ttyAMA0 for a serial connection to the Raspberry Pi GPIO header. This line is commented out by default. Remove the initial # character to enable it. This keeps the LCDd process running in the foreground, so it’s easily stopped with Control+C rather than having to muck around with kill commands. Once we know everything works, the comment character can be added back in. If this throws up an error message, it’s most likely that the wrong device name was specified on the Device line, the DriverPath line doesn’t correctly point to the location of the driver files (or is missing the trailing slash), or the configuration file is not in the expected location. There are a few different clients that can work with LCDd, but the most useful among these is lcdproc, which cycles through several system status screens. lcdproc.conf is the configuration file for lcdproc. It should be located in the same directory alongside LCDd.conf. This is another hefty file to slog through…you’re welcome to root around and change it to your liking, but the default configuration is pretty useful and we’ll keep it as-is for simplicity’s sake. We’ll set up both LCDd and lcdproc to start up automatically when the system boots. Copy and paste the following into the file as a start; we’ll tweak a couple lines afterward. #       Written by Miquel van Smoorenburg <[email protected]>. #       by Ian Murdock <[email protected]>. DAEMON_OPTS="-s 1 -f -c /etc/LCDd.conf"
The lines of interest are DAEMON and DAEMON_OPTS. Edit these to reflect the actual locations of the LCDd program and configuration file, respectively. Then we’ll set up lcdproc to start a little later in the bootup process. You might need to change the path to reflect the installation on your system (e.g. might be /usr/local/bin or similar). Now reboot the system. The LCD should spring to life automatically, cycling through several screens of system information. You’ll need to download and build from the source; there’s no packaged installer available (i.e. similar routine to “The Hard Way” in the Linux instructions). To do this, you’ll need to have XCode installed (the currently-available version requires OS X 10.7 Lion or 10.8 Mountain Lion), as well as the supplementary Command Line Tools (Preferences→Downloads). Automated startup is more involved. Compare the output with the device first disconnected, then connected, to help track down the correct device name, and edit the Device= line in LCDd.config to match. The LCD drivers are located in /usr/local/lib/lcdproc/ by default; edit the DriverPath= line in LCDd.config to match (and remember to include the trailing slash). The LCDd daemon is located in /usr/local/sbin by default. The lcdproc client is in /usr/local/bin (and must be run as root — use “sudo” during initial configuration/testing). The auto-start configuration is also notably different, given OS X’s unique method of launching daemons. Remove the initial # character to enable this line, then save the changes to the file. It’s slightly awkward…this line should be enabled in lcdproc.conf (which runs in the foreground), but disabled in LCDd.conf after testing (the background daemon). If you’re on a multi-core system, increase this number to suit. For example, on a 4-core iMac, I’m using a 4X-ish larger value of 5.0. 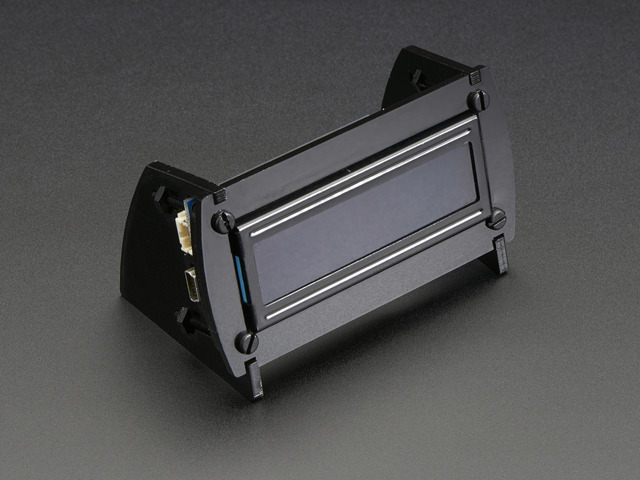 This sets the processor load threshold at which the LCD backlight will blink (to indicate heavy work). At startup and login, a lot of processes are launched and may temporarily trigger this blinking if set too low. On the next reboot, the LCD should begin cycling status information per the lcdproc configuration. If there’s no response from the LCD, it may be the wrong device name in the LCDd configuration file. Double-check the value there against the contents of the /dev directory, and test by running LCDd from the command line. This guide was first published on May 10, 2013. It was last updated on May 10, 2013.